Patience My Brother :: RickeyStokesNews.com! Everyone in Tumbleton called Wesley Johnson, “Wes.” Wes Johnson was born Wesley Pearce in 1919, but for reasons unknown, his mother sent him to live with his aunt and uncle, who raised him along with their two biological children on the property of Mr. John Harper Oates, a white farmer whose land was worked by a large black community of sharecroppers. Wes Johnson was 18-years-old, tall (6’2”) and strong. Oates had a baseball diamond on his property and Wes liked to play baseball. He worked odd jobs and also worked at a store in Headland that was five miles away from his home. On the days that he worked in Headland Wes would catch a ride to take him to work. On February 2, 1937 Wes missed his ride to Headland and that day would be a day that has haunted me ever since I was first told about the lynching and hanging of this young man several years ago. 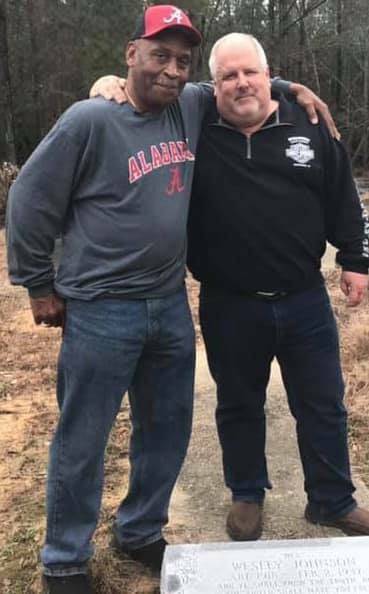 For years I tried to find where he was laid to rest without any success until recently when I was blessed by meeting a relative ...Faye Walker Howell. Finally I knew where he was laid to rest 80 years ago. No marker, No concrete vault ...just a few patches of grass among weeds covered his grave. I don’t know exactly what came over me as I stood there but I felt a strong need to lay my hand on this hallowed ground and say to Wesley ...I Love You My Brother. A few days later I was eating dinner in a local restaurant when a sudden thought came flashing through my brain. I Need To Get Wesley Johnson A Headstone !!! I had recently ordered two headstones for two young children here in Dothan who were both buried in unmarked graves just a few years ago. Wesley was quickly buried in a unmarked grave 80 years ago so did it really matter that he didn’t have a headstone after all of those years? 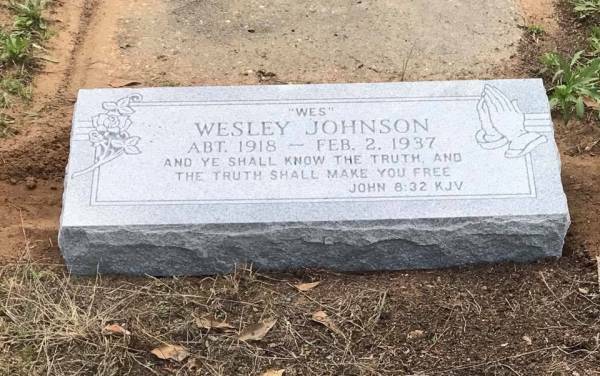 IT WAS WAY PAST TIME FOR WESLEY TO FINALLY HAVE A NAME OVER HIS GRAVE AND I WAS GOING TO GET ONE FOR HIM WITH HIS RELATIVES BLESSINGS. My children will tell you that I have spoken to them and to others about Wesley for many years. He was shot multiple times and then was left hanging in a tree for several days for others to see. just like every other child who left this earth way to soon.